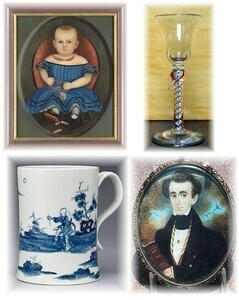 Specializing in miniature portraits, English Georgian glass and porcelain, American folk art and portraits, and early textiles. We have extensive expertise and interest in those and other areas, including English pottery and decorative accessories of the 18th and 19th c, and in American formal, high country, and paint decorated furniture from 1740-1830. Although we have a large client base of dealers and museums, we pay the same careful attention to beginning collectors and one-time shoppers. All items are guaranteed in writing. We maintain a varied inventory and will also be glad to search for items on a commission basis, or to examine lots and bid for you at auction. 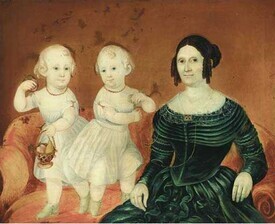 And, of course, we are always interested in buying fine antiques, portrait miniatures, 18th century drinking glasses and porcelain, folk art, and paintings. Please feel free to contact us regarding anything from a single item to an estate.